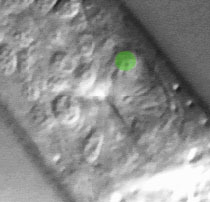 Identification: The pm6's are large fried eggs easily recognized by position and by the line they form with pm7 and a neuron. pm6D is on the dorsal midline, straight anterior from pm7D and just posterior to I4. pm6VL and pm6VR are subventral, straight anterior of pm7VL and pm7VR, and just posterior to the very small M2 neurons.